This classic 6 ft settee comfortably seats 3-4 people and adds a touch of elegance to any outdoor space. 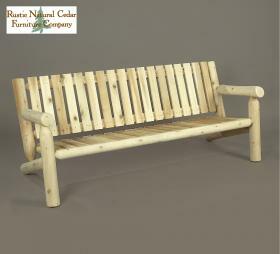 Crafted from the finest Northern White Cedar available, this settee features a smooth-sanded finish that will provide years of carefree enjoyment. The sturdy, light-weight cedar used to construct this settee does not shrink or warp, and is naturally resistant to decay, insect, and weather damage. The creamy color of Northern White Cedar if left untreated, gracefully weathers to a silver gray.